The Curtiss P-40 Warhawk was among the best-known and most-produced aircraft of World War II. The P-40 was also the Curtiss model built in the greatest quantities, with 13,738 produced between 1939 and 1944. All were manufactured at Curtiss’s Plant No. 1 in Tonawanda and Plant No. 2 in Cheektowaga. The P-40 saw action from the beginning of the war to the end, from the Middle East and North Africa campaigns (where British pilots first painted the famous “shark mouth” nose art on the fighters); to Pearl Harbor and the Philippines in 1941; to China with the famed American Volunteer Group, or “Flying Tigers;” in the hands of Soviet pilots on the Eastern Front; to domestic defense of Alaska’s Aleutian Islands; as well as in Australia, New Zealand, and the South Pacific. Maligned and praised by pilots, the P-40 more than held its own, producing many of the first aces of the conflict and some of the highest fighter kill-ratios, helping the Allies survive the first critical years of the war. What it lacked in climb rate and high-altitude performance it made up in dive speed, maneuverability, firepower, and especially ruggedness—the latter enabling the plane to absorb punishment and bring its pilots home alive. Curtiss-Wright employed 43,000 Buffalonians by 1943, fortifying the city as the center of the nation’s aircraft industry. 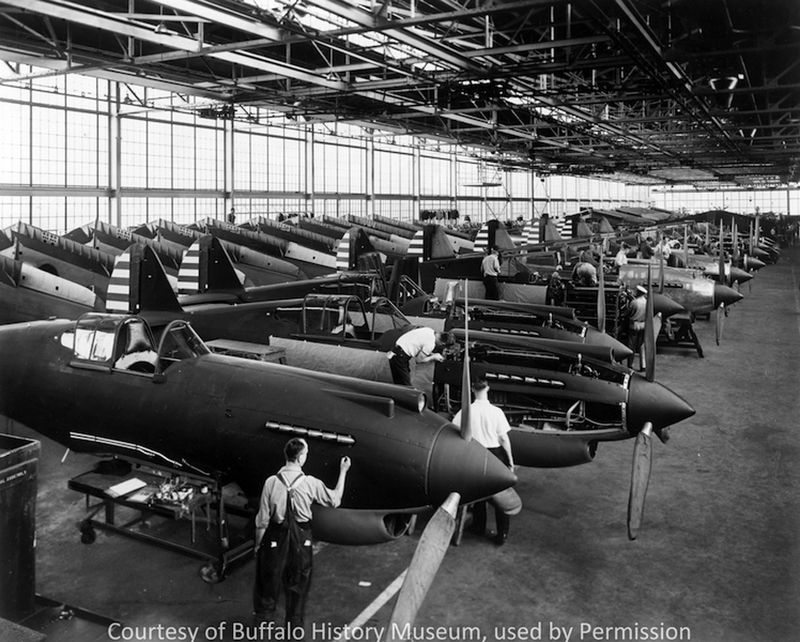 However, by 1946, during the postwar drawdown, Curtiss shuttered all Buffalo operations. The Tonawanda plant, shown here at Vulcan Street and Kenmore Avenue, still stands.